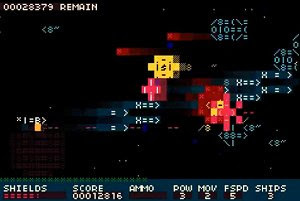 Altcode is a shoot’em up unlike anything you’ve seen before, using ASCII art to create spaceships, projectiles and scenery. Players may choose one of three ships, each one with a patent quality – the heavy ship is strong and powerful but slow, the light ship is very maneuverable and the medium ship strikes a nice balance between the two. Along with Tumiki Fighters, a Katamari-inspired shooter, Altcode is one of the most original offers in the genre and one that is tremendously playable.